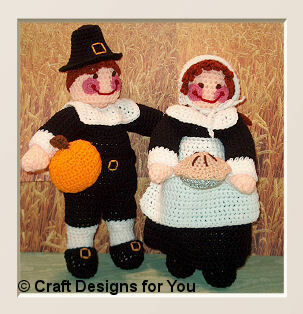 Crochet these sweet Thanksgiving Pilgrim Outfits for your Jeremy and Julie Dolls! Pattern includes instructions for both boy and girl doll complete Pilgrim outfits, pumpkin and apple pie. Also included with the pattern is the silver cord to crochet the pie pan.